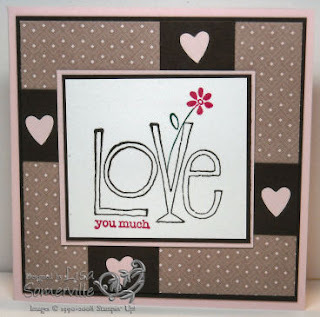 This is a card I made using SCS Sketch 207 for a recent swap using the items found in the Love You Much Bundle. I used markers to color my image then stamped on white card stock, layered on chocolate chip, then my pink base under my focal image. The DSP is from Candy Lane and is layer on Chocolate Chip, then my Pink base card. The hearts on the Chocolate Chip strips are from the new Heart Punch included in this Bundle. If you'd like to puchase these items - you can email me - they currently are not available through my DBWS. Finished size - 4-1/4" x 4-1/4"